Chris Brown Sports Fur Coat in First Promo Picture for 'Fortune'; Will PETA Attack Him? Chris Breezy completes his casual look, which consists of a black hoodie, Louis Vuitton Damier Collection belt and a pair of jeans, by donning a fur coat. 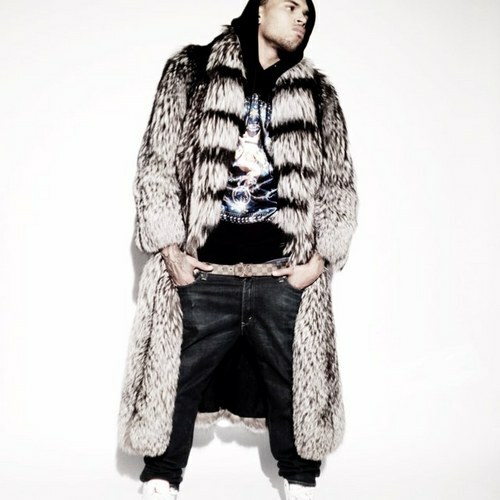 C.Breezy has revealed what is believed to be the first promotional picture for his next studio installment "Fortune". Posting the new stylish image on his Twitter, the R&B singer is seen rocking a dope but I'm sure controversial with PETA full-length fur coat on top of his black hoodie, LV belt and jeans. While it's unclear whether the fur is real, if it is, Breezy might have to prepare himself to answer a complaint letter from PETA. The animal rights organization recently sent one to Dr. Dre after the Hip-Hop mogul launched fox-fur headphone. Two days before unveiling the picture, Breezy posted a link to his new song with Kevin McCall, "Mona Lisa". He followed it up by tweeting another note the next day, "LAST TWO WEEKS of me finishing FORTUNE! I'm excited for all the fans to hear my real music." Though he's been actively promoting the new album on Twitter for quite a while now, Breezy won't do any interview for it. His manager recently confirmed that it's a strategy they are going to apply to maintain his positively-steady progress back to the top. "We're not trying to be rude, selfish or disrespectful to anyone in any way. If people are going to judge anything, judge him for his talent," it was explained. "He signed up to sing and entertain. Not to talk about his personal life. We look at it as starting all over."